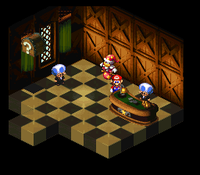 Grate Guy's Casino is a secret area in Super Mario RPG: Legend of the Seven Stars. The casino is run by the jester Grate Guy, and can only be accessed with a Bright Card acquired from his partner Knife Guy. The casino can be entered through a secret passage in Bean Valley. In one of the pipes in the center of the valley, Mario has to defeat a Chomp Chomp and jump three times to make an invisible platform appear, which opens the way to the casino. Mario can get hints on how to find the casino from a sleeping Toad in Nimbus Land's inn. One game available is the slot machine. Mario has to set a number of coins, then hit a treasure box three times, stopping it at the same symbol each time. If he manages to, he is awarded a Frog Coin. Another game is Blackjack, played with the normal rules, but without face cards; the player plays against the dealer, and the one who comes closest to 21 without going over wins. The third game is "Look the other way". This is a simple game where the player picks a direction to face, and if they look in the opposite direction as Grate Guy's finger, they win. The Star Egg can be won by beating this game 100 times. The music played in this area is the same song, though a rendition of the music, heard in Super Mario Bros. 3 when playing Toad's Card Matching Game or the Spade Panel's panel-matching game. In the game of Blackjack, if Mario and the Toad tie, the Toad will take away one of his Frog Coins. This page was last edited on November 28, 2018, at 21:55.